I’m french and I bought a heidelberg windmill (1970). Everything works fine but the machine seems to run too fast even at the lowest speed! Is there any adjustment to check or a way to lower the speed? Thank you for your help. If you could post a video, it would be much easier to tell if the machine is indeed, going too fast. I believe the slowest speed of a Windmill is still 2000 impressions per hour (once every 1 1/2 seconds). Oh, on edit: Look at the specification plate on the motor, it should run at 1725 (or so) rpm. Here’s a video I had the lowest speed, what do you think? That is a little fast. By timing that video it looks like you’re running at around 2800 imp/hr. Definitely faster than mine runs. I have a 1730 rpm motor with a 2295mm belt. With the press off and set to the lowest speed check where the belt sitting in the V drive. It should be all the way at the bottom. i came up with approx 28-2900 (on yours) also. i will check mine in the morning. @danielheff, i’m french so, what do you call “V Drive” ? Do you want a photo of any part of the press ? The v drive is the spring-tensioned pulley that is mounted on the shaft of the motor. It may be, as suggested, that the pulley is not able to open fully resulting in higher than expected speeds. Have you oiled the pulley? i checked mine today, it slows down to 1800 IPH. the indicator says 2200 IPH on the crank. my motor may be over adjusted. the point is, your press should be able to go much slower than the 2880 IPH i counted. 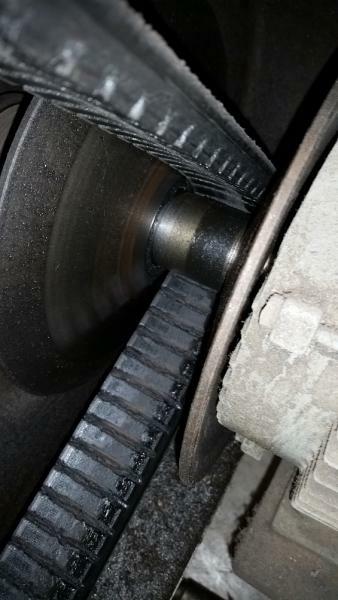 Make sure when slowed down on the crank and indicator, your belt is deep into the drive pulley as shown in the pic. If your belt is not this deep into the pulley, but your crank and indicator are slowed down to limit, the fix is to move the drive motor back on the mounting plate more. 2) with press at a standstill crank the speed up a lot, if not all the way, DO NOT rotate or cycle the press AT ALL. 3) with the slack now in the belt, loosen the motor mount bolts and carefully slide the motor away from the flywheel. Taking some measurements before this, or marking some reference lines, will help you to keep the motor square to the drive line. 4) try just moving the motor an inch at first, understanding that since the belt wraps nearly 180 degrees around the pulley, this is effectively taking up almost 2 inches of belt slack. 5) tighten the bolts up and crank the press speed back down to slow, just enough to take up the belt slack. 6) move the flywheel forward by hand, to allow the belt to seat itself into the drive pulley. 7) start the press and see how slow it goes. LISTEN CAREFULLY as you slow the press down, if any weird noises arise, STOP cranking. you have probably bottomed out the belt into the pulley, or possibly gone to the limit of the pulley itself. You have moved the motor too far. Go through the above procedure but move the motor a bit towards the fly wheel to where when you slow the machine down, it is as slow as it will go, without damaging anything. If it is still too fast, but slower than originally, and,,, no noises, repeat the procedure until you find this point. just go a little at a time. I will try to measure the distance from center to center on the pulleys on my press, but, this may not be real accurate, do to the variations between old belts. Count your fingers before, then after, this procedure. there are some pinch points here, so Please, Be Careful.